The Wolf Vigil Ladies T Shirt features 4 our the Wolves who have lived at Wolf Howl Animal Preserve. From left to right are Waya, Niko Akni, Nita and Ohoyo. They are all up on their stone den guarding the pack. Wolves are always keenly aware of their surroundings. This Wolf t shirt is made of 4.5 ounce, 100% ring spun cotton jersey knit. They are pre-shrunk. These are a slightly fitted t shirt to flatter the figure. See size chart below for a good fit. Machine wash and dry inside out on the gentle cycle. Do not bleach or iron on the graphics part of the shirt. 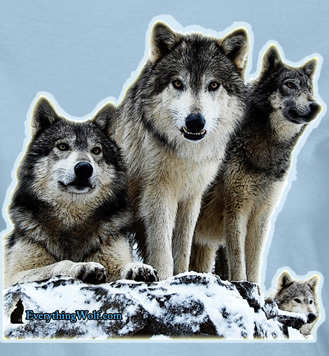 This is a wonderfully soft ladies t with beautiful wolves on it.